I love cartoons (that's not the confession). The actual confession is that I've never before watched the animation of Seth MacFarlane! Why? I always thought he was trying to knock off The Simpsons so never watched. Before Christmas I did a series of cartoons as a wedding present for two friends. They were really well received and on the back of it I was asked to create a Christmas card for them. I was then commissioned to create a montage piece featuring them partying with characters from their favourite cartoons; The Simpsons, Family Guy and American Dad. The problem is that to draw the characters I need to understand the characters. 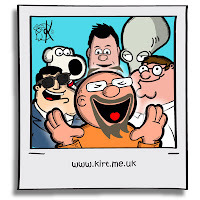 I get the Simpsons, I love the Simpsons but I'd not seen the cartoons of Mr MacFarlane. 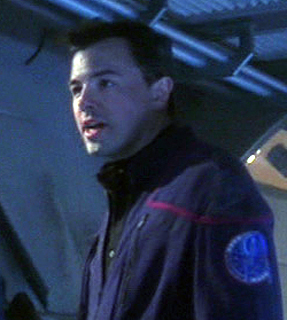 In fact aside from Seth's cameo in Star Trek Enterprise (Ensign Rivers in 2 episodes) I had not seen any of his work until I watched the 'Ted' movies (which I thought were hilarious). At that point I'd considered watching the cartoons but just never got around to it. But now I had to draw some characters so I started watching. And watching. Hell I'm still watching now and I finished the commission. So I completed the drawing last week and early indications are that it's been favourably received, I'm waiting to hear the final verdict. So the side effect from this is that I'm loving watching Family Guy and American Dad, I have so much material to get through I'm going to have plenty for some time to come. What about other 'grown up' cartoons? Cartoons were originally created with an adult audience in mind, then children hijacked the media and took them away from us. 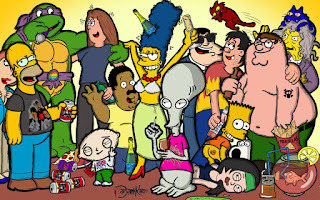 Happily there were some people who created cartoons that either crossed the age range (like the Simpsons) or that were aimed at a more mature audience. 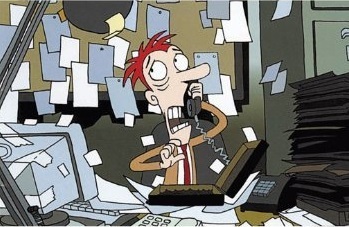 I used to watch South Park but got bored eventually, and there was a British cartoon called 'Stressed Eric' which ran for only 2 seasons back in 1998 (I'd love to see more UK based grown up animation). If there are other cartoons I should be watching I'd love to hear about them. One thing that's clear from all this... I love cartoons! My commission is now in the public domain thanks to my wonderful patrons so I'm happy to share it here now. 1801.01 HAPPY NEW YEAR ANYONE?